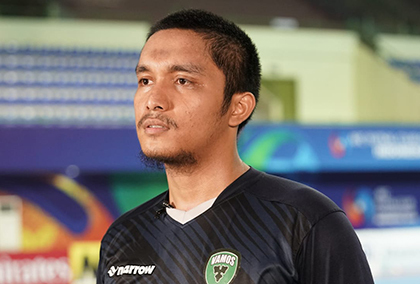 Yogyakarta: Captain Syahidansyah Lubis is hoping to create history by steering Vamos FC to their first AFC Futsal Club Championship title. Backed by home support, Lubis has replaced Sunny Rizky Suhendra as captain, will lead a much younger side compared to the team that featured in the 2017 championship. At Ho Chi Minh last year, Vamos finished third in their group behind Al Rayyan and Naft Al-Wasat and Lubis said the experience was invaluable for the team who were the first Indonesian side to play in the Continental tournament. The current Vamos squad is much younger than their predecessors but what they lack in experience, they make up for in sheer determination. “Last year’s experience was valuable for Vamos. It was the first time playing in the AFC Futsal Club Championship in Ho Chi Minh where we earned three points. Vamos and Victoria University College, who the home team play in their opening match, have never met before and Lubis is not taking anything for granted. “We have never faced Victoria University College before, but the players in the Myanmar national team are motivated, skilled and organised. “We are definitely very proud as this is the first time Indonesia is hosting an AFC Futsal tournament and Vamos are representing the country. Vamos will give their best for Indonesia. Yogyakarta: Vamos FC head coach Reza Falahzadeh has a point to prove as the hosts kick start their 2018 AFC Futsal Club Championship in Yogyakarta on Wednesday. Falahzadeh’s side face Victoria University College of Myanmar in their Group A opening match and the Iranian is confident Vamos can collect three points against the debutants. “Vamos feel like a new team as we have changed many players in the last couple of months. Those players’ contracts were up and we have brought in new players and we need some time to perform as a unit. “With respect to the other teams, I feel we can make it in this tournament and hopefully into the next round. “We know the Myanmar futsal team and facing them will be very difficult but my players are focused for tomorrow and we will take the three points. Making their first appearance in the competition, Victoria University College players will be tested in Yogyakarta and coach Htay Myint wants his team to stay focused. “This is the first time we are participating in the AFC Futsal Club Championship and we only had two matches to prepare for this tournament. Three-time AFC Futsal Club Championship winners Nagoya Oceans return after a year’s absence and will open against newcomers Dalian Yuan Dynasty FC. Head coach Pedro Costa believes his team have what it takes to reach the quarter-finals despite missing last year’s edition. “It was the first time we were absent from the competition, but we won the league and we are here now. Dalian Yuan Dynasty are making their second appearance in the competition as head coach Lee Jian Lei is hoping his young side can bring their league form into the Championship. “We had a tough preparation as the team was involved with the China Futsal Super League which ended 10 days ago. Yogyakarta: Head coach Miguel Rodrigo is confident his Thai Son Nam side can put up a strong challenge in the 2018 AFC Futsal Club Championship. Last year, Thai Son Nam finished third on home soil in Ho Chi Minh City and the Spaniard believes his side can improve. “The team is ready, we have been training very hard. Vietnam players have a good work ethic, they’ve sacrificed a lot and they learn very fast. The Vietnam outfit will be making their fifth appearance and play Korea Republic’s Jeonju MAG in their opening match. “Everyone thinks Jeonju MAG is the weaker team but I know Lee and he is a very good coach and it’s going to be a tough match. Jeonju MAG will be creating history when they open their account against Thai Son Nam as the first Korean team to make an appearance in the competition. Head coach Lee Young Jin is confident about Jeonju’s chances. “I can’t share my game plan here. It’s a secret! We are the new team in this competition and I agree with Miguel on his comments about me... It’s true I am a good coach. “Miguel has been a good friend, he is always advising me and has shared a lot of knowledge..he is like my master,” quipped Lee. “The biggest test for us is to see how fast Jeonju are against the Vietnamese players and we are Koreans, Koreans are not weak. Nafit Al-Wasat, the 2016 runners-up, will open their account against UAE’s Al-Dhafra and head coach Haitham Abbas said they are focused. “Two years ago we finished runners-up and last year we reached the quarter-finals. It won’t be easy but we will give it our best. “Nafit Al-Wasat didn’t have much time to prepare for the tournament as we featured in the Iraqi League which wrapped up two weeks ago. Al-Dhafra coach Luis Fonseca Cilleros is treating the opening match against Nafit Al-Wasat like a final. “We are very focused on the tournament especially for the first game against Nafit Al-Wasat. It’s like a final for us and my players are ready. Yogyakarta: Defending champions Chonburi Bluewave are out to make tournament history by becoming the first team to win back-to-back AFC Futsal Club Championship titles. Head coach Rakphol Sainetngamwas is confidentt the two-time champions can win the 2018 AFC Futsal Club Championship in Yogyakarta. They open their Group C campaign against Australia’s Vic Vipers on Thursday. “We know there is added pressure on us after winning last year’s tournament but we are on the right track and I feel our team is up for the challenge. “Last year, we were kind of a surprise package as nobody expected us to win the tournament, plus there was no pressure and we did well. “Our team is pretty fresh after wrapping up the Thai league and preparation has gone rather smoothly. “Chonburi had a successful training stint in Japan where we played three matches and even though they were friendlies, we took them very seriously. Vic Vipers will be making their third consecutive appearance in Asia’s premier club futsal tournament and head coach Milton Sakkos was optimistic about his side’s chances against Chonburi Bluewave. “It will be a tough match against Chonburi as they are the defending champions. We know what they are capable off and we know what to expect. In Ho Chi Minh City last year, Vic Vipers ended their campaign without a win and will be aiming to turn their fortunes around in Yogyakarta and advance past the group stage for the first time. “This will be the third time Vic Vipers are playing in the competition and the challenge for us is to improve and advance into the next round. In Group C’s other tie, FC Erem will face Qatar’s Al-Sailiya and head coach Daniar Abdraimov is confident his charges will perform in Yogyakarta. “My players are ready to go and we are confident of showing some improvement here in Yogyakarta. The Kyrgyz Republic club will be making their second appearance following their group stage finish last year. Qatar’s Al-Sailiya will be making their debut and head coach Imran Miguel Alves Cunha was cautious of his approach towards their first match. Pressure will be on Al Sailiya to perform as Qatar’s representatives have advanced to the knockout stage on six occasions since the tournament's inception in 2010. “Our build up was good but we changed players two weeks before the tournament and it will be good for the players to get match exposure. Yogyakarta: Boasting a star-filled lineup which includes Hossein Tayyebi and three-time AFC Player of the Year Ali Asghar Hassanzadeh, Mes Sungun Varzaghan are the team to beat in Group D of the 2018 AFC Futsal Club Championship. “We are happy to be here and our preparations have gone well,” said head coach Hamid Bigham Tabrizi. Mes Sungun Varzaghan will open their account against FC Sipar and Tabrizi is confident of winning against their Tajikistan opponents. “Our team has done a good job tactically and technically and we look forward to playing our first match against FC Sipar. “It is not going to be easy as we have not analysed Sipar in terms of strength but I believe we can produce the desired result." Iranian clubs have a habit of making the semi-finals since the first edition in 2010 and have produced three different champions but Tabrizi was coy when asked about his team’s chances of winning the tournament. FC Sipar are tournament debutants but head coach Benyamin Eghbali is confident his side can pull off an upset against Mes Sungun Varzaghan. “We had a good build-up and we are looking forward to playing the Iranian team. Bank of Beirut, the 2015 and 2017 quarter-finalists, will be making their fourth appearance in the competition and head coach Dejan Dedovic says his team is primed to face AGMK of Uzbekistan. “I’m looking forward to the match against AGMK tomorrow, they are tough opponents and we can’t take them lightly. “History is on our side as no Lebanon team have lost a match against an Uzbekistan side, so we are aiming to continue the trend. Dedovic was also confident of advancing to the last-eight stage. AGMK FC will be making their debut and head coach Petrov Denis said his team will take a patient approach into the match against Bank of Beirut. “We had a good training camp and have been preparing for the tournament since claiming the the Uzbekistan league title.